Is Claymore one of the better kept secrets? Well, not by me - when people ask what it's like, I confirm it is one of the best shows all year. A number of traders seem to agree, and are prepared to go what is more than 'the extra mile' for the event. The new venue is spacious and lacks the 'steaminess' of the low ceilinged, if more famous, Meadowbank. Yes, it is a show of two disconnected halves. Yes, it is the eve of Festival, so Edinburgh's beds are expensive and mostly already booked ... but the gems are many. A truly first rate selection of games ... beautifully presented, but - as is becoming more the trend this year, it seems, interesting too (more and more, when you ask about the mechanisms, designers are using homegrown systems or freestyle adaptations of more popular choices. 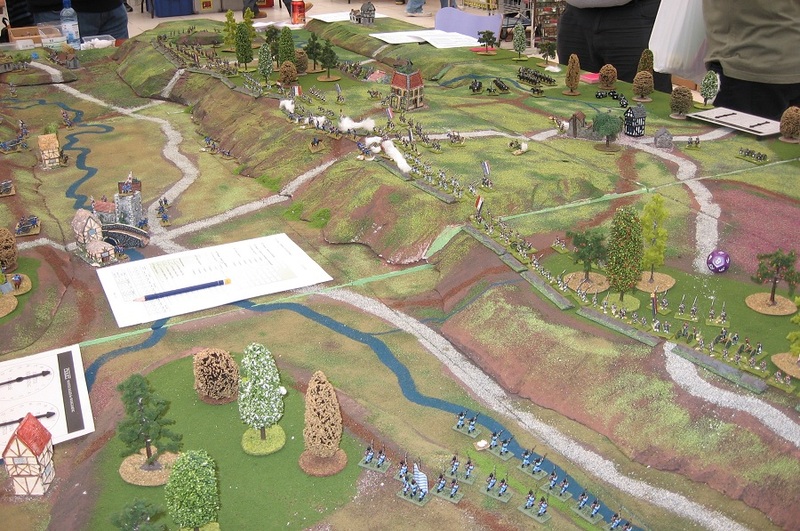 Seldom will the game be just a static figure display purporting to be a game of an equally obvious wargame. 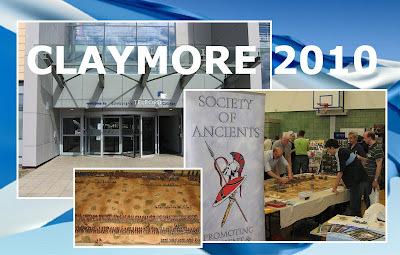 Also, Claymore seems to attract a very worthy coverage, from ancients to 20th Century, from Skirmishes to grand battles like Zama. 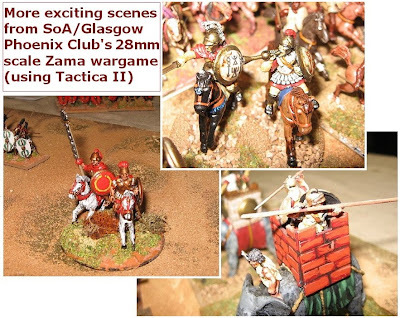 This year, the Society of Ancients was presenting the Glasgow Phoenix club's Zama, the centrepiece of the Scottish BattleDay, held over the same weekend as the Bletchley event and my Battle Day Workshop at Sheffield. 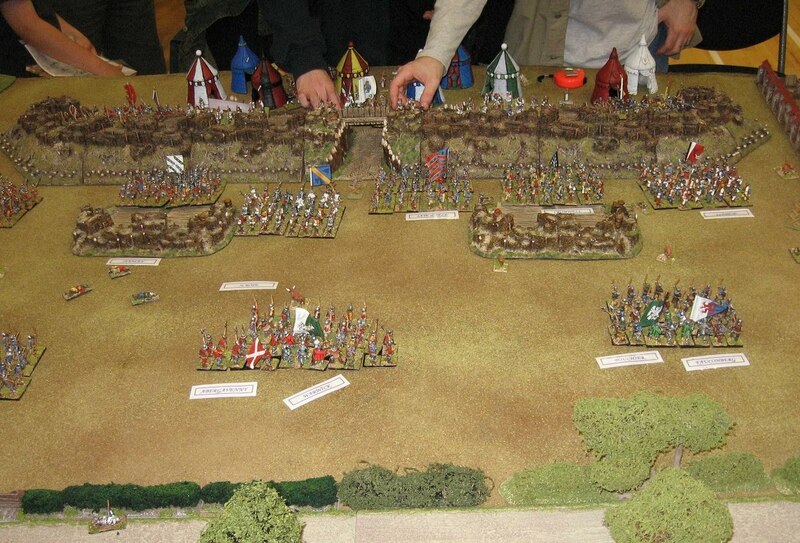 The game is an enormous 28mm figure game using Tactica II and well over 1000 figures. Despite all that kit, and plentiful breaks to chat to visitors (and interupting SoA Committee members ...)... the game easily played through during the day. 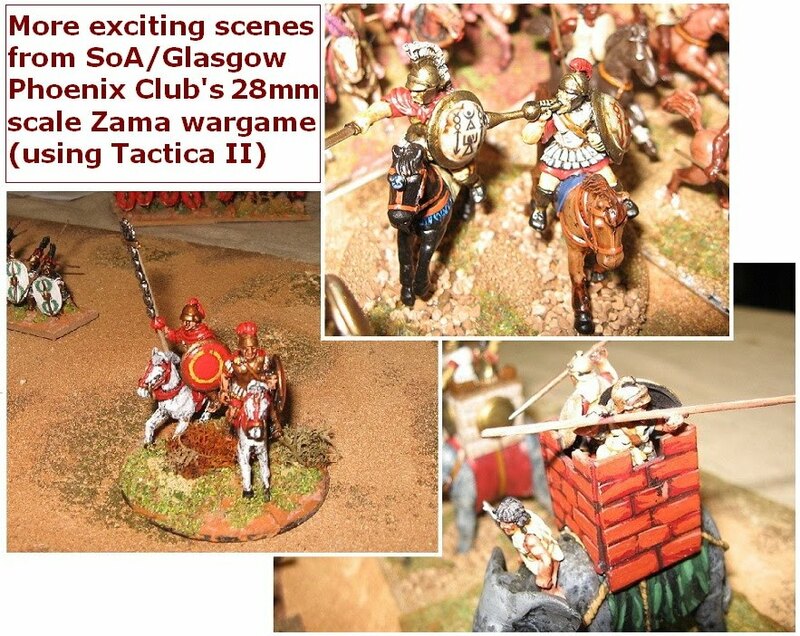 I will post a little more about the game in my 'Zama wrap up' coming shortly, together with more pictures from the Edinburgh variant. Suffice to say that on this occasion, Hannibal won (though maybe not in the fashion envisaged by the Carthaginian when he devised his plans back in 202 BC!). A great display, an intriguing game, and lots of eye-candy for the visitors. 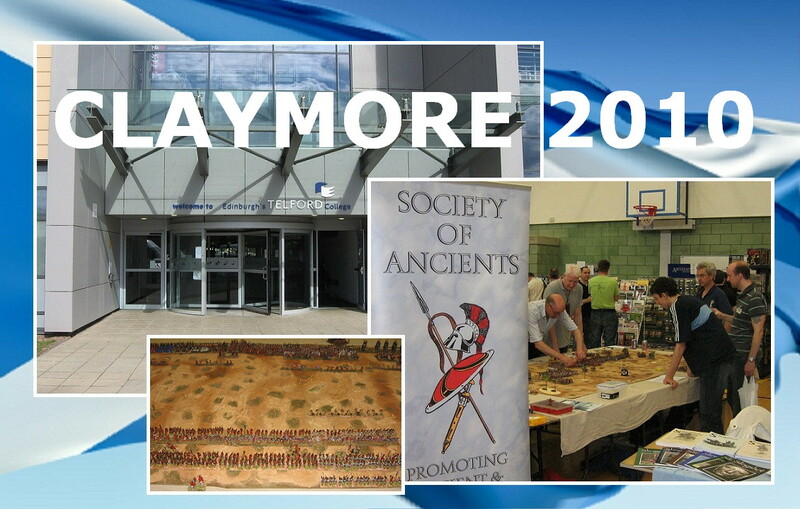 Many thanks to Paul Innes and his crew, for combining such effective support both for the BattleDay and for the SoA's promotional effort in Scotland (the Zama game has done the other main shows, too - see here for Paul's Zama thread which reports on the game's Scottish tour) .. 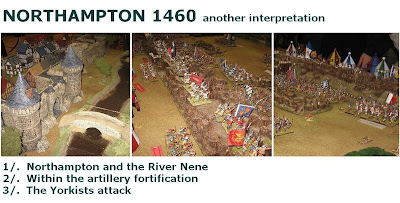 In case you hadn't noticed, this year is the 550th anniversary of the Battle of Northampton, and I've included a fair bit of coverage here. It was interesting to see Northampton's fame reaching as far as the firth of Forth - and interesting too to see the battle recreated in miniature, this time following the more traditional site by the river (as shown in the Lance & Longbow Society publication, generally, as shown on the map here ...)... Locals might be more than a little impressed with the impressive vision of medieval Northampton. The idea, of course, is to put the battle site right up against the river, as at the battle of Castillon (probably the prototype for the Lancastrian plan), and opposite the town. Although they have gone for some pretty grandiose earthworks in this depiction, the scale is probably not wrong - one just needs to imagine this elaborate position dug into the landscape rather than superimposed (dug into the landscape and filling up with water, of course) ... The main issue with this interpretation is that Delapre Abbey ends up on the wrong end of the line, and it is hard to imagine how anyone standing by the Eleanor Cross could have looked into the trenches (over a mile away). 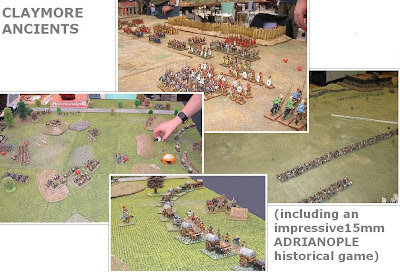 Reporting on things ancient and medieval, there were some other impressive ancients games including a big WAB game, and a 15mm Adrianople which just ticked quite a few boxes for me. 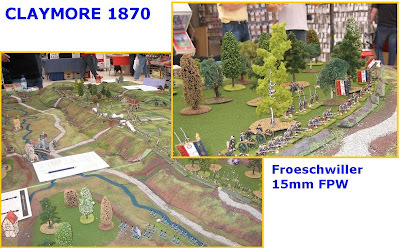 More generally, I particularly liked the big 15mm presentation of Froeschwiller (Worth) ... and its mighty depiction of the French position magnifique. 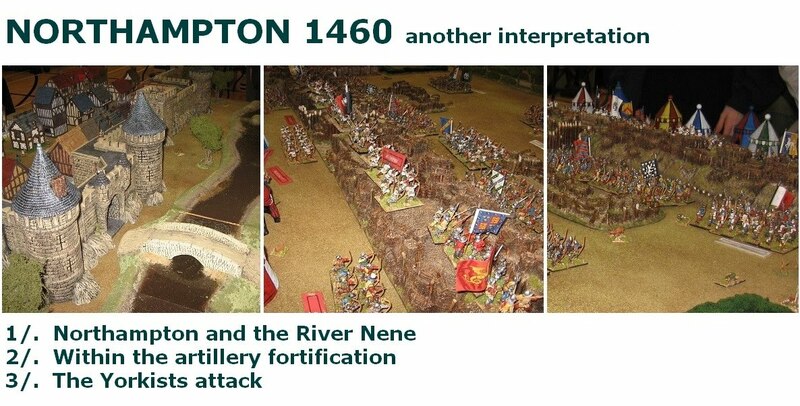 I did a 10mm version of this myself a few years back, so know the topography quite well - and Claymore was one of those occasions where you see something from across the room (and in one of the smaller scales) yet it captures its battle so well it is instantly recognisable. That's a big tick.For those of you looking at the picture but not familiar with the battle ... er ... yes, the Prussians won this one - well, at least, took the French positions. However improbably ... having mauled the Prussians and substantially beaten them off, the French fell back, deciding it was just all too precarious. (Spaghetti Western game from the RAF Luchars outfit) (WW2 Amphibious Assault game) ...I also quite liked the Napoleon in Egypt game. Yes I know Nappies can be very boring - but visually, this one got away from the 'dull green battleboards with every Napoleonic figure ever manufactured on them' syndrome, and presented something interesting and easy on the eye. Yes .. a very good show. And sort of 'on the move'. Crammed-in between shows in Edinburgh and Manchester, I have had a batch of Championship games set up with Committee and Show Team colleagues. Home and Away in Northamptonshire ... and another to follow on the Friday of Britcon. The championship is a great opportunity of all enthusiasts to get involved in a 'low impact' way (your games will be as 'gamey' as the opponents you choose to play), but your results count in the mix with all the rest of us (any and all, of course, fellow Society of Ancients members) - and there are some great prizes up for grabs (figure vouchers, ready painted battle groups etc.). There are also just about as many ways to play as there are wargames types out there (Computer games, boardgames, and figure games from all different perspectives): all you need is the will to get involved. Fresh back from playing Field of Glory at the Doubles Masters, my first game was an Armati encounter against Richard Lockwood. Just in case either of us was up and ready for that game we warmed up with a run of my 'Double DBA' Zama game (but more of that when I do the Zama wrap shortly) ... 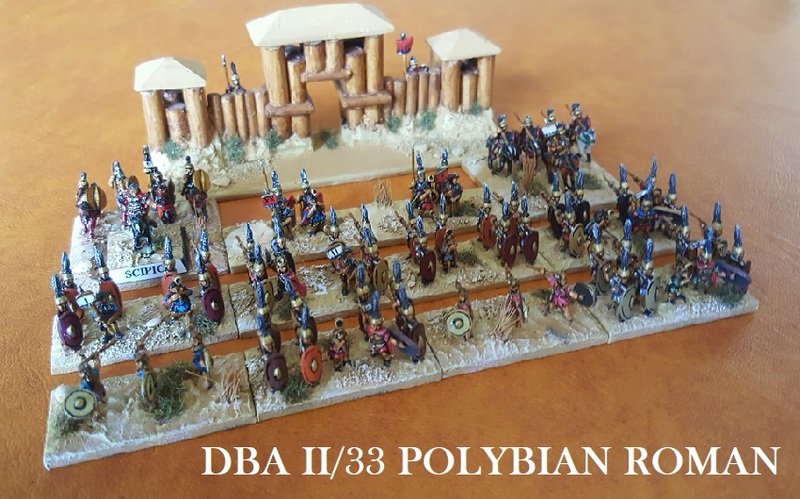 I was the host, and had set up a fairly open plain plus a choice of two Triumph of Cavalry armies - Abbassid Arab and 11th Century Byzantine (OK, I know the later is AoC, but I was just using that list to field a slightly de-tuned Nikephorian with plenty of LC in it). Richard followed his established loyalties and picked the Byzantines. Richard went for a strong right hook, with an underpowered left comprised mostly of Skirmishers and LC. I had opted for a more balanced deployment, but with my weaker cavalry on the right, and my (even weaker) infantry out of command and out of the way (right rear of my battleline deployment zone). With some cavalry to back up my skirmishers, I should ultimately win on the right, but the mighty Byzantine right would crush me in the end. So I had to slow them - maybe get a few against the odds - long enough to win the skirmish and shoot out. I got very lucky with the game's first decision point. I had mixed Bedouin camels into my line in the hope this would hold them up (camels take away cavalry impetus in Armati, and also - on a 5 or 6 - panic the horsemen, making them fight on a lower factor) ... a standard Arab ploy in Armati, but one that can back-fire (as you are offering up intrinsically weaker troops ...). Contacted both by Cataphractoi and Cavalry, both were panicked (I think the first time Abbassids controlled by me have pulled that particular rabbit): it would indeed be a slog for the enemy, and I was now pretty much guaranteed one of those units. The Arabs did well in the shooting, and losses on the skirmish wing, plus faring badly against the camels, left the Byzantines looking for a decisive intervention in a battle that was otherwise going against them. 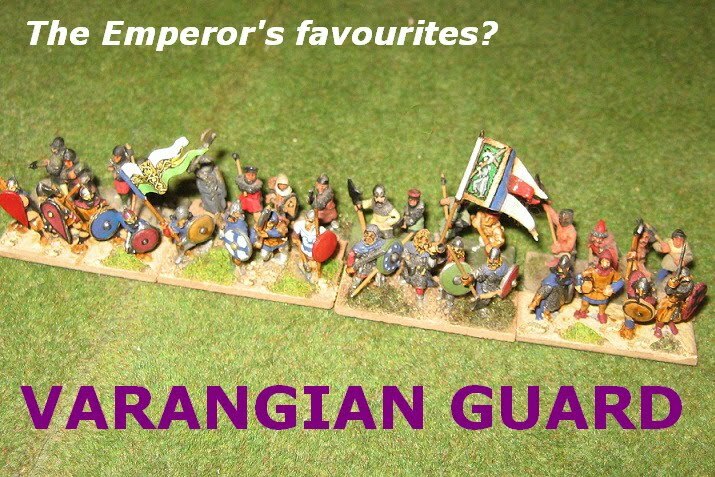 Richard looked to the Varangians, who had been pushing up in support of the centre throughout the game. The loss of another unit of cavalry, this time to the Ghulams, created the opening, and ignoring a barrage of archery as they pushed forward, the northern mercenaries eventually were close enough to charge in. It was, perhaps a fitting end. 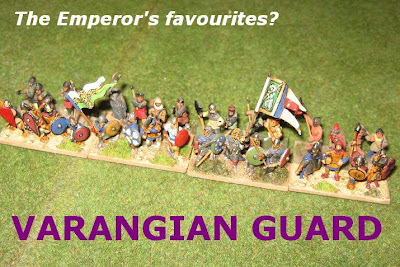 The Varangians threw a 1 in melee, and - counting as charging, and with 1 fresh charge left - the Ghulams threw a 6. 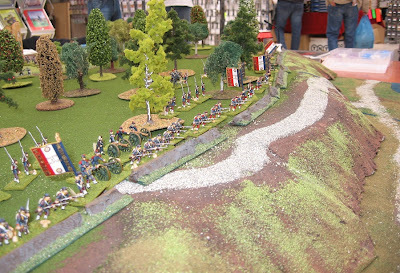 This was more than enough to break the infantry on contact and rout the army. 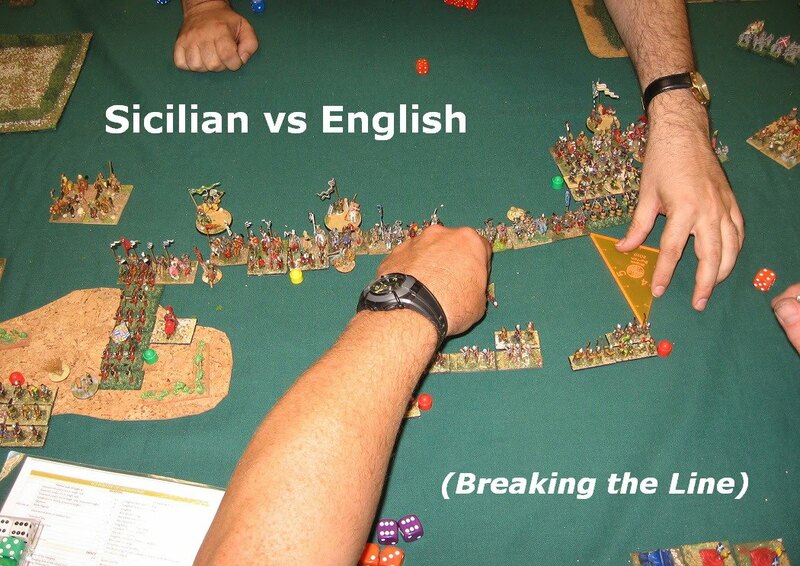 It had been one of those wargames: entertaining and challenging, but with all the critical die rolls going one way. To face Will's Late Romans, I chose the Byzantines myself, but morphed to an earlier spec. 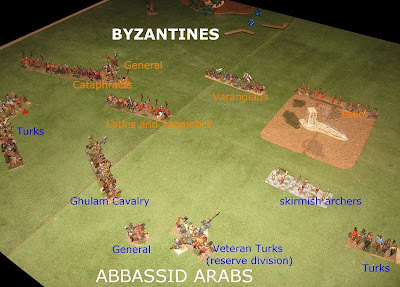 (Maurikian) ... very similar, as are all these Byzantines (slightly more archery, especially as Armati classifies these earlier Skutatoi as spear/bow, whereas the later ones are just spear - assuming the bowmen are skirmishing). 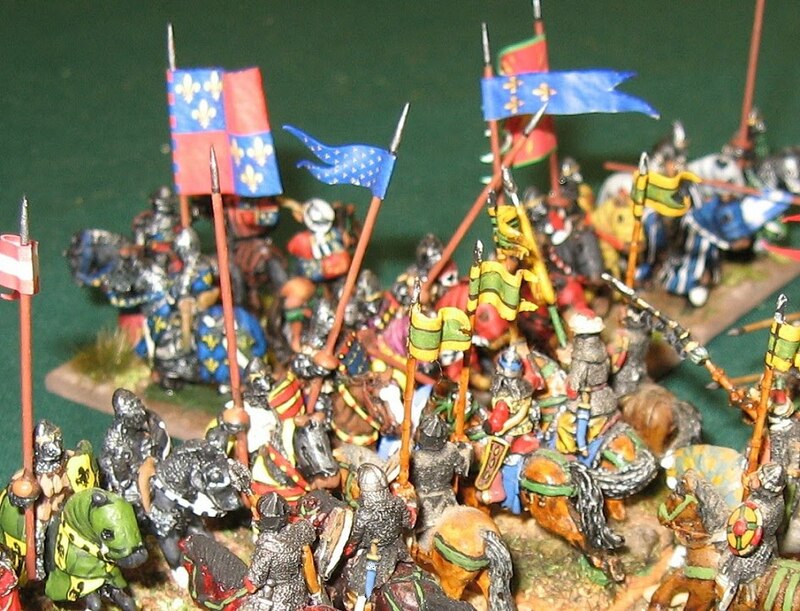 I intended to dismount some of the cavalry to stiffen the line - as I was pretty sure there would be some Gothic Warband coming my way in the centre. It being Will, I also feared big wings of LI/LHI Auxilia chucking javelins and looking to trap my prized cavalry in unwinnable multiple melees. My plan would be to stand off for as long as possible, and just whittle the Romans down to their key troops before committing anything valuable to the fray. Easier said than done - but as Will intended to draw me on, maybe surprise me with concealed troops, I was able to start the shoot out on terms I thought favourable. I just about got where I intended with the skirmish before Will (a turn or so late, I thought) called for a general advance ... and I thought he was pulling the battle back when the end came. The decision to dismount some cavalry was vindicated ... when the expected German impetus charge came in on the Skutatoi, the scores were level (the +1 stiffening from the cavalry just negating the 1 pip by which Will out rolled me). Without it, the Skutatoi would have gone down on contact, and my centre would almost certainly have collapsed. On the other end of the line, we routed some Legionaries who had already been seriously worn down in the shooting, and fell upon the exposed flank. Meanwhile, the armoured cavalry comprising most of my right had done little other than hold their ground, shoot back, and rely on their high protection to provide a solid and secure flank for the infantry. 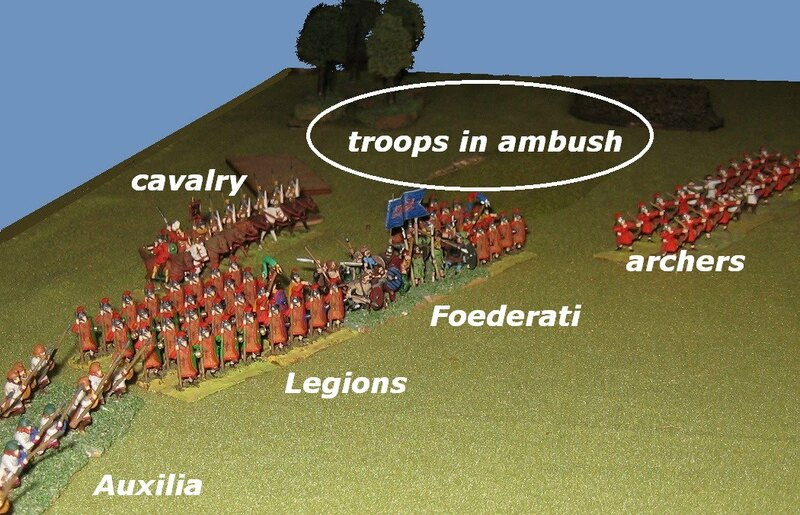 It was just about enough, and with their right lost and enveloped, the Roman army routed. Excellent work from my (now quite venerable) Byzantines ... they managed to lose their combats against me, but win when I was in charge. Of course, I say 'combats', I mostly mean shooting: despite some awesome fighting values, the army is mostly bow-armed, and - in FoG or DB, as well as Armati - I try to think in terms of an empire that lasted a thousand years ... (so no need to hurry). Well, that's a couple of games under my belt and a good, if a little tardy, start to the 2010 Championship. Originally set up as a 'series' of Doubles events around the country - indeed, Britain, by the time a Scottish round was added - the Doubles Masters been through a few years where some of the venues struggled to get a good turn out. While lack of local organisers, lack of publicity, clashing with an increasingly busy programme of other events have all played their part, the solution applied this year was to focus the competition on a core, mid-year, event that has always worked and proved popular - the Oxford round (and 'home' venue for organiser David Fairhurst). Although it is admittedly disappointing to lose the ambition of a nationwide series (and which thereby means everyone - UK at least - should have a Society sponsored event fairly near to them), this new strategy is, at least, reinforcing success - and Oxford is also a reasonably accessible venue (yes, it is south of Birmingham, but it does have good Motorway connections). The Society of Ancients therefore actively sponsors the English DBA Open held in Portsmouth, the Northern DBA Cup held in Sheffield, Armati by the Sea (Bournemouth), Anderida Doubles (for which, after cancellation in Pevensey, there is, this year, a stand in event in Farnborough) which is FoG and DBM - and we award the 'sportsmanship' trophy at Britcon in Manchester. Adding Oxford for the Doubles Masters (also FoG) to that, we could get the net thrown wider ... but the spread of events and rules choices is not too bad. 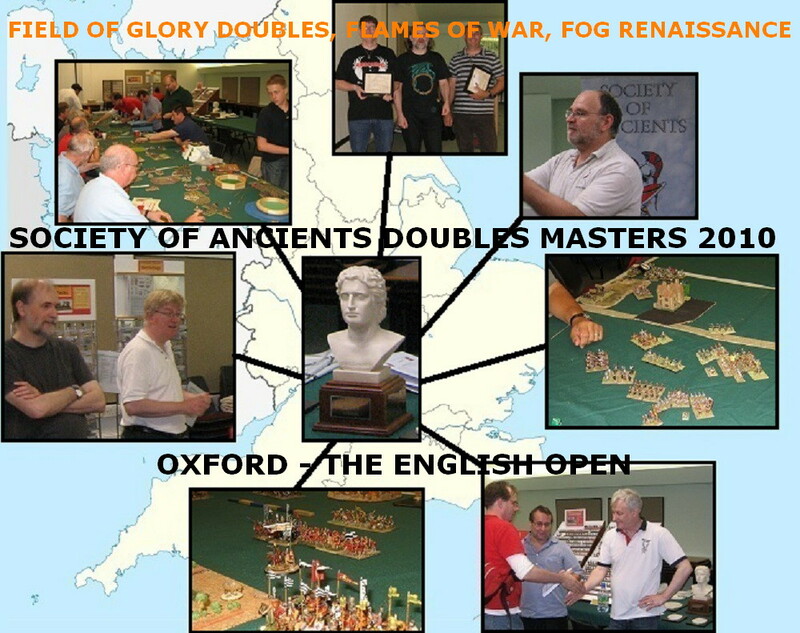 Of course there are numerous 'one off' donations we have made around the world, and the Championship is there for everyone to join in anywhere in the world (and we have entrants from as far from the Society's English HQ as New Zealand ...)..
Hopefully, this spread of events, rules choices, and locations will enable fellow members who enjoy wargames a fair chance of finding a Society of Ancients event they can enter, whilst enabling us to reach out to non-members and hopefully encourage them to join up. The event itself was an obvious success. We were at a new venue - the Wheatley campus of Oxford Brooke's University (about 5 minutes off the M40). Having just about squeezed everybody into Wolvercote Village Hall last year, the move to a bigger venue merited a full turn out. To a FoG 900 point 15mm Doubles event (our bit) was added a Flames of War (Axis/Allied pairs) and FoG R singles options. Ancient and Modern Army Supplies/Donnington Miniatures joined us in sponsorship (See their website, here ...) and added some spending vouchers to the trophies and SoA goodie bags. 70 odd players entered, about half in the Doubles Masters. That was a good result, I thought: the venue was fully utilised but without the unpleasant intimacy we sometimes have 'enjoyed'. Chris joined me in the SoA team. We had a mixed bag of results but 4 very good games. I continue to enjoy Doubles as the more satisfying tournament format (whatever the rules) ... sociability clearly wins over competitiveness in a 'four hander' (and although FoG has its intricate corners, it is less fiddly and provocative than some of its predecessors). Everyone seemed to be smiling, and the Umpires were seldom called (actually, I was sufficiently absorbed in my own games I'm not sure who the umpires were or if they were needed at all. I had a query about how disordering terrain applies ... so just asked a player on another table - and my opponent was happy with that 'second' opinion. That's Doubles, really). We could hardly have asked for more as opponents. We took Later Sicilian (an old favourite). Game one was against Ian Stewart and Jim Gibson with their French Ordonnance. Game two was also against French Ordonnance (doesn't matter how many times you throw Charles of Anjou out of Italy, his descendants will come back to haunt you I guess), this time Richard Bodley Scott and (Ancient and Modern proprietor) Damien Ranasinghe. Game three, happily still medieval, was against 100 Years War Continental (Kieth Pullen and Mike Urich) ... they would have needed to bring their stakes to fight against us. And our last game was against veteran Doubles combo Kieth Martin Smith and Wayne Dare. They had a Hellenistic army, so this was our only seriously out of period encounter. 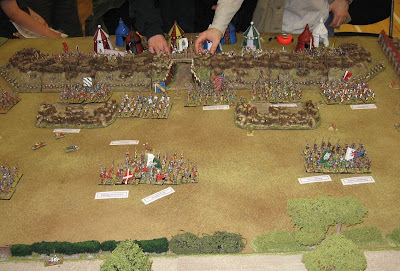 We had losing draws in the first and last of those games; we got stuffed by Richard and Damien's pike-heavy Ordonnance in the second game (but we did sack their camp - that'll learn them! ), and we returned that compliment to the English (who did not have any stakes) on the Sunday morning (except we didn't let them near our camp). All the games were closely fought and great fun - even when we were wiped out by the French it was through losing initially even combats, then failing more cohesion tests (said the steamrollered victim as he disappeared under the big wheel!). We ticked all our player satisfaction boxes ... most of our games were in period, we sacked a camp (in fact, 2), killed a general and won a decisive victory (and, as it happens, not all in the same game!). We can't have been too far off a par result of course ... but both the score draws were against us. In addition to the main results, we awarded a new prize - the Founders Prize - in recognition of the success of this long running event ... set up by Ian McNeil in 1992 (before the days of the BHGS) with support coming from Slingshot editor Paul Szusikiewicz (Paul and I played in that first year as 'team 14') ... with the event becoming the Society of Ancients Doubles Masters in 1993. By that token, next year will be the 20th campaign season. 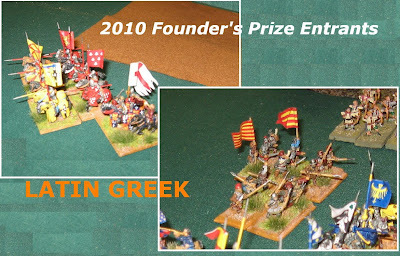 Simon LeRay Meyer and Dave Saunders won the Founders Prize as comparative newcomers with a good approach to the game and a good looking Latin Greek army which fought bravely rather than grudgingly and provided plenty of entertainment. Sadly, for Doubles, that's it til next year (but judging by this event, make sure you don't miss it in 2011) ... I'll have to see if I can get another game in the Northern Doubles before the year is out.